Wish had an article after his latest Chicago Marathon race this year where he discussed how Chicago as a city get’s behind the marathon and that the way it’s done is something the city of Austin and it’s leadership should look at. I have to agree with him and I’m glad he brought up the topic of races in Austin which has been dormant since the City Council passed the new events ordinance. During the course of the Task Force and city council meetings I had a few blog posts, multiple e-mails and also we had the keepaustinrunning site up with updates. It costs more. Yes, go figure having a cone, that is bigger at more frequent intervals makes it more expensive. Having a policeman and a barricade makes it more expensive than just having one of those. Roads are closed longer. It takes longer to put bigger barricades out, it takes longer to put more cones out … it also takes longer to take them off. This means the rules we have (which other cities seem to do without very well) are part of the reasons people get annoyed by races. Since last December I’ve run two marathons. The California International Marathon and the Portland Marathon. Two different states and two different cities, and both of them had no trouble closing fully or partially large roads, in Portland a lane was closed on what was pretty much a highway and the number of cones there per 100 feet was less than we have on a city road in Austin. I was safe with an 18 wheeler there but am not with a Prius here … it’s just unnecessary but we have an office in the city that get’s to make the rules as it sees fit without any citizen oversight. I’m looking forward to some of the City Council taking up the health initiatives the city is promoting and going out of Austin and running a half marathon or marathon. Maybe then they’ll see what Austin can do to make marathons a great experience for the runners, for the residents of Austin be reducing the inconvenience and a more effective fund raising effort by reducing the unnecessary costs some city staff are imposing. It’s been great to just unwind after the Portland Marathon, my running/physical activity has been very limited. The plan is to take it very easy until we start up again the first week of November to train for the Boston Marathon. Last week, just to loosen the legs out I hit the elliptical on Wednesday for 20 minutes, a quick 5 mile run on Saturday … with breakfast with Damon and Jason being the real goal, and today was a 4 mile run. Hopefully be back in the 50 miles per week range to get going in November but if I’m not … oh well, it’ll come with it comes. Yes I am venting a little here. I saw this recent post on the runtex web-site advising beginner marathon runners to heel strike … NO DON”T DO IT. Just think of your running form, think of your basic physics class, you’re pretty much putting force back into your body instead of propelling forward. Just land flat footed if you can’t land in the mid-foot. Just go look at any kid (not the “gifted one” anyone) and look at them run around … there is no heel strike, we have a natural way of running. Heel striking just doesn’t make sense when you’re jogging or running. That doesn’t mean you have to run on your toes, land flat, mid-foot, fore-foot … just don’t land on your heel and plan on this roll forward nonsense. I’ll share something somebody wrote to me on the topic to draw a pretty funny parallel. Had me rolling in laughter but honestly the advice to heel strike is just as absurd. When swimming I recommend keeping your head above water at all times – it just feels a lot better. When cycling i like training wheels, that way if i slow down too much i don’t fall over. Got down to the lobby at 6:10 and met up with a number of Team Roguers. Larry and I were both trying to great 2:50 but both decided a few weeks ago that we wouldn’t run together since we have very different running styles and race plans. We all made our way out of the hotel, quick left, then down 3rd street to the start. Larry and I started jogging half way there to warm up, found our way to the bag drop and then made our way to the start. As we got closer to the front we could see the pace group signs, pretty close to each other, and before we knew it we were all the way in the front, ahead of the 3:00 hour pace group and with a red tape in front of us, in front of that some empty space, then another red tape and the timing mats ahead of that. As we get up to the red tape one of the volunteers says, anybody running faster than 3:00 hours should come up in front of the first red tape. Larry and I look at each other and then make our way up. It’s very strange to be so far up front in a race. The Portland marathon doesn’t seem to attract the fastest folks apparently. It’s 6:30 and we need to warm up so we leave the start area, run around a block and then back to our spot. Slowly it starts filling up and the “elites” line up in front of the second red tape. It was a very strange feeling being in the 2nd row at the start of a marathon with 8000 people. This was a bit of a cluster. The Portland Marathon has a “wave” start. Note that all the tape that was dividing people is now gone. Ok, I guess that makes sense. The wheelchairs go off and then of course most people assume the countdown for everybody else … NO that would not be the case. We were far enough in front to hear that the next start was for the elites only, everybody else would go a minute later. So the gun goes off again for the elites and probably 15 to 20 other people go along for the ride since the “wave” start was so confusing. One guy next to me gets pissed off, I’m like whatever, this is the least of my worries … I’m not wasting any energy getting worked up over this. Then the gun goes off for us. The start is almost a fifth to a quarter mile up-hill, followed by a hard right turn and decent. Damon, Muz and I had walked the start two days before so I knew what to expect and I wore my Garmin at that time to know where the quarter and half mile points were to gauge my pace initially. 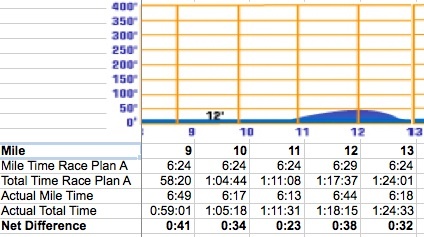 In my race plan (read here) I broke the race up into a five sections. 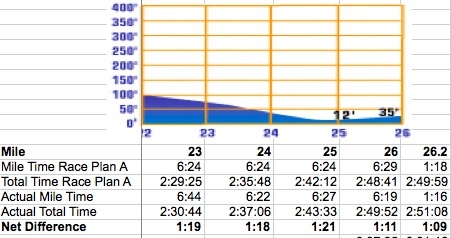 The first section was intended to be at “MGP” effort for a 2:49:59 marathon which on a flat course would be 6:29 minutes/mile. 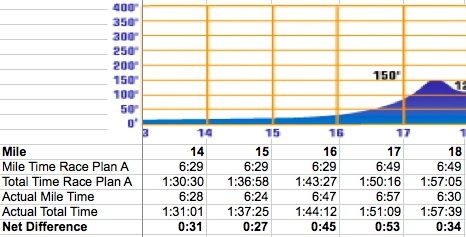 Even though the first mile was net downhill I planned on not going faster than flat MGP pace since it was the first mile and I’d need to warm up. Overall the section worked relatively well, as I would have expected. The hill between mile 2 and 3 was tougher than I expected but the second mile wasn’t as difficult as the course profile from the marathon web-site (which by the way is very misleading as far as what is really going on at many points in the course) so I was net 2 seconds off. Once the downhill section ended I had trouble getting back into pace until the end of mile 8 so lost some time overall in the section. I realized this but didn’t really worry about it, I figured it’s time I could try and make up later on if things work out, no point going crazy right now. I dropped my running vest (an Austin distance challenge finisher vest from when I ran the Motorola Marathon in 2004) after the first mile, then the gloves and arm warmers right before mile 3. Thermolytes (2 pills) with my water bottle around 1.5 miles in (this was planned and written on my pace band as were all other planned times to GU and take termolytes) and then threw away the water bottle since there wasn’t much of a crowd in front of me. Saw Steve’s mom before mile 2 cheering us on. On the turn up mile 2 I noticed my foot was slipping on the road. It had been drizzling and the road was wet and this was an early reminder to try and stay off the painted road surfaces and on the wetter and sliprier surfaces like concrete. Got a bunch of “Go Kam”‘s from people on the side since the bib had “Kam” printed on it and also a few “G0 Team Rogue”‘s because of the singlet. At the water stop at mile 6 to 7 the guy infront of me came to a complete stop, I yelled “Holy $#!t” weaved around him and unfortunately knocked into one of the girls handling out water. What is going on, this guy is running 6:30 paces and is STOPPING AT A WATER STOP!!!. Wait, now as I look at that mile it was 6:36, a few seconds off. Not sure if that was the reason or not but it did distract me a little. This was the section where I planned to bank some time for the big hill between 16 and 18. This section had some up-hill so I was hoping to be faster than flat MGP for 4 of the miles. Coming into this section I was 16 seconds off and coming out I was 32 seconds behind. It seemed like mile mark 9 was of to me, or I was breaking down. At mile 11 I felt good since I was able to pick up my pace and not really feel like I was going to crazy. What really hit me was the next uphill climb, it was a lot tougher and longer than I expected and I lost quite a bit of time there and was almost 40 seconds behind. BTW, I wasn’t really thinking in this much detail at this point. As long as I was within a minute of where I needed to be I felt I had a chance of breaking 2:50 so this was all still good. In this section there were a number rail track to cross. My left foot got caught first and I started feeling some discomfort in the arch on my left foot, nothing to stop me running but something was tweaked. Then my right foot got completely caught, I stumbled and my foot came out and I kept going. On this second one I was grateful for some of my trail runs that taught me to be light on my feet and keep my feet relatively loose so there wouldn’t be too much damage if my foot gave way. This section has the big hill and the goal was to each my effort back to a flat based effort. I expected to loose some time on the up-hill. I felt good this entire section. I was within range of a couple of folks and just ran and tried to stay comfortable. Looking back it seems the build up to the hill and the hill were harder for me than I thought they were. When I ran the hill I felt great. I think I passed 10 people on that hill. After the hill and crest on the bridge nobody managed to pass me on the race which was pretty cool. The section overall was fine, I was still around 30 seconds off which was very reasonable to try and make up if I felt good. At this point I was thinking I just need to get back into my pace for a couple of miles and then see if I can push a little earlier than I planned to make up the 30 seconds. In this winding section through a neighborhood the original plan was to run it at MGP of 6:29. About a mile into this section I heard lots of cheering, the lead woman was right ahead of me. I did manage to pass here. After looking at some of the stats post marathon I passed 30 people in the last half of the marathon and nobody passed me … that was kind of cool. I think Damon passed 100 people! This section is where the wheels came off. As I sated in my race plan I started the season at the end of April hoping to get over my injury ridden training season for Boston 2009 … which I ended up not running because of tendonitis and to try and break 2:55 in Portland. After the second race prep results and talking with Steve I decided to drop my target to 2:50. This is 10 seconds a mile faster which is a lot. Both the time and running aggressively and out of my comfort zone where my goals. Well I definitely managed to get out of my comfort zone. Mile 19 was a little off, and then slowly by mile 21 I was 10 seconds off pace. These were very uncomfortable miles, my legs weren’t responding, I felt some soreness and twitching in my quads and I felt like I was pushing my effort but was running slower and slower. Steve knows I can enter my “cocoon” of comfort. 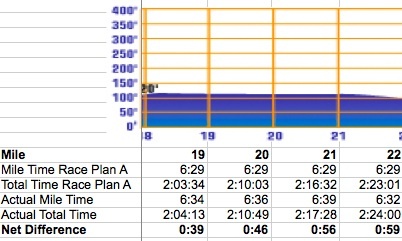 My backoff plan was 6:40 pace which is what I was running. I told myself NO, you have to try. I remembered Ruth’s text from the morning “Run like the wind” and all the positive comments from everybody else in the weeks leading up to the race and tried to push. I relaxed, seemed like my GU and thermolytes from mile 20 were kicking in and Mile 22 was 6:32 so getting better and at this point I decided that with 2.2 miles to go I would go as hard as I could. This is where I planned to make up some time on the nice long downhill section. I finished with an 8 minute PR of 2:51:08 over CIM last year (2:59:09) and finished 41st overall (remember this race doesn’t attract the fastest folks). This was emotionally the most satisfying race I’ve ever run, I was way out of my comfort zone and even when it looked like I was about to break apart I was able to keep going. Thank you all for the support and good luck wishes leading to this race. A big thank you to Steve and Ruth for a truly great training group with Team Rogue and the Rogue community. Last but not least to all the members of Team Rogue for the early mornings of training and keeping me honest and motivated. This is a shout out to my fellow Team Rogue members that I’ve been training with since June 2008. 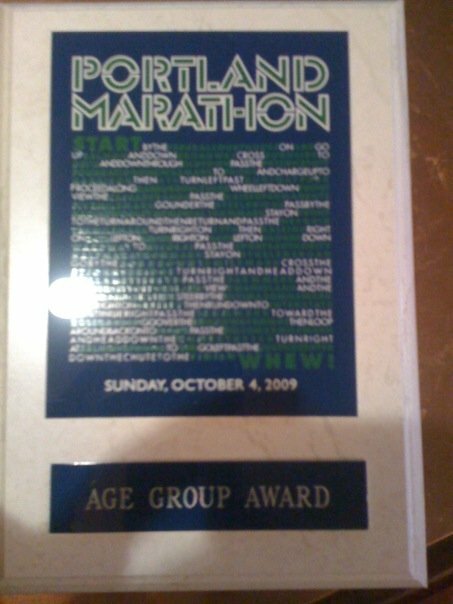 First there was CIM, then Boston (well I didn’t quite make it), and this weekend is Portland. It’s been a blast, I would have never run as much as I did if we weren’t meeting at Barton Springs or Whole Foods at 5:30 am all those mornings. Thanks for getting me to where I am … not it’s all about the race … couldn’t be in this position without you. You are currently browsing the Austin Metronome blog archives for October, 2009.